I’ve been asked at least one hundred times over the past few weeks what I think the impact will be on the Domino’s brand? Will the incident impact sales? How long before people forget about it? Is it already over? These are all great questions, but I unfortunately don’t have a crystal ball. That said, you don’t have a to be a Harvard MBA to know this will impact sales, it has tarnished the brand, and it will ultimately lead to poor business results (at least in the short term). And yes, this was all done by two people (jerks) who are now learning a hard lesson…but unfortunately at the expense of Domino’s. Let’s see how an incident like this really impacts a brand and a business. It’s one thing to project how this will impact sales, the brand, etc. and it’s another thing to become part of the case study. Last Thursday I ended up taking a later train home from New York and knew I wouldn’t have much time to make dinner. As I was ready to get off my train, I decided that I would quickly pick something up on my way home. I got off the train and knew there were a few fast food restaurants right by the train station. This is where it got interesting. As recently as a few weeks ago, I would have no problem making a quick stop at one of the fast food restaurants to pick up some dinner. But this time was different. The first thought that hit me was of the two Domino’s employees messing with the food they were preparing. I feel horrible saying that, but that image was simply the first thing that came to mind. I could not for the life of me get that image out of my head. As I walked to my car, I couldn’t get over it. That’s when I pulled out my Blackberry and ended up ordering a much more expensive dinner from a restaurant in my area (even though I knew that I would have to wait 20-30 minutes to pick it up.) Yes, I decided to spend four times the amount of money and wait an extra 20-30 minutes in order to avoid fast food restaurants. As I waited for my food at the restaurant, I started to think about how many other people this might have happened to. How many people were about to order from Domino’s, stop off at Taco Bell, visit a Burger King, and then thought of the infamous Domino’s YouTube video? How much revenue has Domino’s lost? 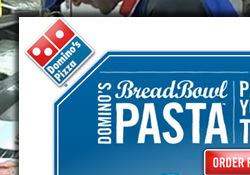 And beyond Domino’s, how much revenue is being lost by the fast food category based on what happened? I believe there is a ripple effect from the Domino’s incident. How Many Glenn’s Are Out There And How Much Money Is Being Lost? Let’s say there were 50,000 people in the United States like me who decided to bypass fast food restaurants for lunch or dinner. Next, let’s estimate that they would have spent ~$25 per month. That’s probably a few meals at a fast food restaurant. 50,000 people x $25 per month x 12 months would be $15 million in lost revenue per year. That’s a lot of dough, no pun intended. So the two ex-Domino’s employees could be responsible for approximately $15 million dollars in lost revenue annually. And that doesn’t take into account the damage to the brand… Amazing, isn’t it? In closing, I feel horrible for Domino’s. They don’t deserve this. In addition, I’m not sure their competitors are benefiting either… If there are others like me, and I’m sure there are, they are running for the hills when thinking about fast food. Personally, I’d rather dish out more money and wait on longer lines to ensure I have an Executive Chef overseeing the preparation of my dinner. How about you? Post a quick comment below and let me know.